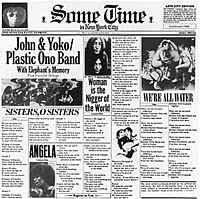 "Some Time in New York City" uses a newspaper as metaphor for delivering songs. Almost every song focuses on specific events or people in the news at the time. The album came with a second disc from a live performance of John and Yoko with Frank Zappa. It was released June 12, 1972 (US) and Sept.15, 1972 (UK). Singing, "Have a marijuana if you can"
He sang, "The Pope smokes dope every day"
Singing, "Power to the people today!" Singing, "Long Tall Sally's a man." Singing, "God's a red herring in drag!" The Statue of Liberty said, "Come!" When they nailed the coffin lids! It's those mothers' turn to burn! And you know what it's worth! And you'd wish you was English instead! Was raped by the British brigands! Goddamn! Goddamn! Why the hell are the English there anyway? As the bastards commit genocide! Aye! Aye! Genocide! Yes you'd wish you was English instead! Angela, can you hear the earth is turning? -"Yes, we'd like to do a number... This song is about pain." CAN'T SEE NO FUTURE, CAN'T SEE NO SKY. I WISH I WAS A BABY, I WISH I WAS DEAD. COLD TURKEY HAS GOT ME ON THE RUN. MY BODY IS ACHING, GOOSE PIMPLE BONE. CAN'T SEE NOBODY, LEAVE ME ALONE. ONE THING I'M SURE OF I'M IN AT THE DEEP FREEZE. TURKEY HAS GOT ME ON THE RUN. PRAYIN' TO SOMEONE, FREE ME AGAIN. I PROMISE YOU ANYTHING, GET ME OUT OF THIS HELL. WELL, COLD TURKEY HAS GOT ME ON THE RUN. Britain, you killed Hanratty, you murderer! DON'T WORRY, DON'T WORRY, DON'T WORRY, DON'T WORRY. who have no idea what's about to happen, this is in A minor and it's not standard blues changes." -"This is a song that I used to sing when I was in the Cavern in Liverpool. I haven't done it since so..."
THERE'S NOTHING THAT I WOULDN'T DO FOR YOU AT NIGHT. YOU KNOW I LOVE YOU, BABY, PLEASE DON'T GO, WELL. THERE'S NOTHING THAT I WOULDN'T DO FOR YOU RIGHT NOW. YOU KNOW I WANT YOU, BABY, PLEASE DON'T GO, WELL. NOTHING THAT I WOULDN'T DO FOR YOU RIGHT NOW. I KNOW I LOVE YOU, BABY, PLEASE DON'T GO, WELL, WELL. -"Hey, listen! I don't know whether you can tell what the words are to this song but there's only two of them and I'd like to have you sing along 'cause it's real easy. Anybody who comes to the Fillmore East can sing this song. The name of the song is 'Scumbag'. Ok? And all you gotta do is sing 'Scumbag'. Right on, brothers and sister let's hear it for the 'Scumbag'!" SCUMBAG! SCUMBAG! SCUMBAG! SCUMBAG! SCUMBAG! -"Good night, boys and girls!"